Bright Idea USB Light Bulb is a best gadget for computer desk. A plug and play USB Light Bulb to enlighten your keyboard, notes and mind with soft and soothing bluish light. This USB lamp gadget has a light weight of total 65 grams and can be angled and moved in any direction without any trouble. Usually bloggers, professional internet users and, students during exam vacation like to do their work at night by keeping all lights off as habit while using computer. But the person feels difficult when he /she has to take some important points in note book or could not able to see keyboard keys clearly because of horizontal and dim light coming from screen. To get rid of such weird situations a new Bright Idea USB Light Bulb jumps in market. 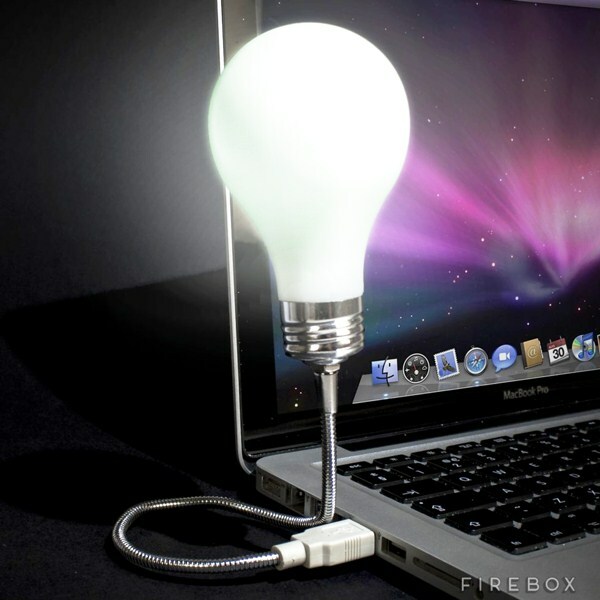 Bright Idea USB light bulb is fuss free; means no stand or legs, no shade, and no switch. To illuminate it just simply plug it in USB 2.0 connector either of desktop or laptop. Give angle to its adjustable arm in any way or keep it above your head to avoid its direct exposure to eyes. It will also glow likely radium in dark when not powered. The Bright Idea USB light bulb price is only $17 USD.